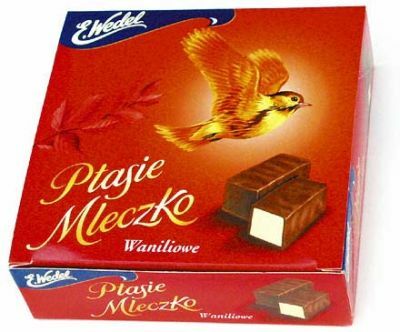 Manufactured by the E. Wedel company, Ptasie Mleczko might win the prize for hardest to pronounce candy I’ve ever eaten. The woman who gave me these pronounced it several times for me, and I still don’t think I can say it. The candy, made in Poland, luckily has English on the box as well as Polish and a few other languages I don’t know. According to my googling, Ptasie Mleczko literally translates to Bird’s Milk. Thanks to the English translation, before I ate one, I knew that they were vanilla marshmallow covered in chocolate. Each candy is 1 1/2″ by 3/4″, and 3/4″ high, and they’re pretty good. 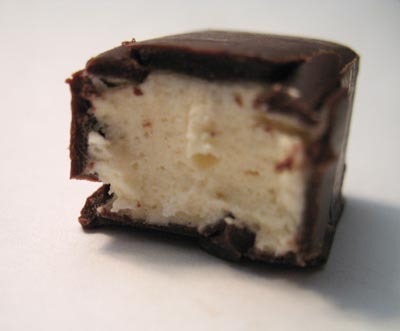 The vanilla is distinct, instead of just being a hint like some other vanilla candies are. I wouldn’t say they are delicious or anything like that, and I definitely wouldn’t call them a favorite, but they’re pretty good. If vanilla doesn’t interest you, they also make them in Chocolate and Lemon. For buying these I would rather recommend http://www.chocoladka.com, they have them for 3.49$ each instead of 6.99$ at russianfoods. Actually, it’s not a marshmallow at all… LOL And they are called Birds Milk, because they are light and fluffy, like a bird’s feather. And are not meant to be “bitten” into, but are meant to slowly melt in your mouth. Being born and raised in Poland until I was 16, these are still my ULTIMATE favorite of all time! (and I am 30 now!) My hubby is Native American, (Cherokee) and these are his favorite too, as well as our 2 kids. Unfortunately, they are hard to come by in the US, so we special-order them from overseas. YUMMY.!!! I have also eaten these since I was a child and have now become so large I cannot leave the house.. Avoid these evil things. I think they are bit big and cuboid to comfortably melt in the mouth, so I’m going for the bitey option. Nice chocs, though. I purchased mine in Tesco in St Albans, UK for Â£1.99. There is also ‘creamy’ taste, I thnik it’s new one, and I like it better than vanilla. I always start by bitting of pieces of chocolate and than putting the creamy foam into mouth. YUM! I had these for the first time while visiting Gdansk, Poland 17 years ago and I never forgot them. I just returned to Gdansk for the first time since then, and I was almost afraid to try these in case they didn’t live up to my memory. But I did and they did. The insides are definitely not marshmallow, although I can understand how the original review might have made the comparison. I adore the fluffy but firm texture of the creamy insides. I’ve still never had anything like it. This trip we tried the vanilla, the chocolate, and the “creamy” flavors, and we all liked vanilla the best. We also saw lemon–and maybe even strawberry–but we didn’t try them. I’m glad to know there are sources for this heavenly confection here in the U.S.
My favorite candy ever! So simple and yet so irresistible, don’t know how many times I’ve finished a whole box by myself going “one more…just one more”.